This easy sour cream pound cake recipe from scratch is considered to be a classic, old fashioned cake. It’s firm and dense but still very moist. Perfect for carving or just serving with whipped cream and fresh fruits like strawberries. This old fashioned sour cream pound cake recipe is probably one of the most vintage cake recipes. I have seen TWO types of pound cakes- with sour cream and without sour cream. They both taste GREAT but I think the one with sour cream is more moist and soft! You can check out my no sour cream pound cake recipe HERE from my early blogging days. Just pardon the horrible pictures! lol. I am not sure if this is the typical Southern sour cream pound cake but it sure is the BEST sour cream pound cake! 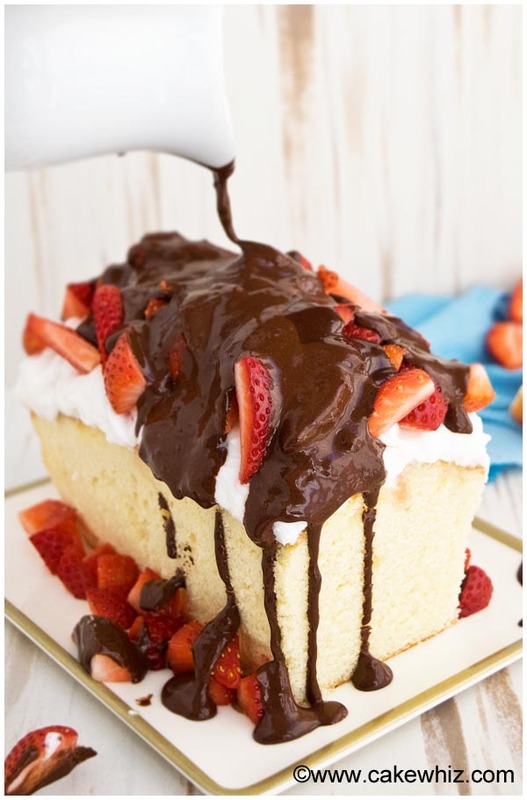 I topped it off with fluffy buttercream icing, fresh strawberries and a Nutella syrup drizzle and it’s a HEAVENLY dessert that you can serve at any party! There are so many DIFFERENT ways to make this cake with different ingredients. Various extracts like almond extract, rum extract, vanilla e.t.c. Why do you add sour cream to cake? What is the use of sour cream? Sour cream has a high fat content which adds a lot of moisture to the cake and gives it a very rich flavor. It also helps with the firm texture of this cake. How long does it take to make a sour cream pound cake? It takes 1 hour to 1.5 hours. The cake is considered fully baked when an inserted toothpick in the center comes out clean. Can sour cream be frozen for later use? Yes, but sour cream has a tendency to separate when it’s frozen and thawed. You can still use it in baking and cooking but not in dips or as toppings. Mix in sour cream and extracts. Mix in flour and baking soda until just combined. Pour batter in a loaf pan. Let it cool down and remove from pan. 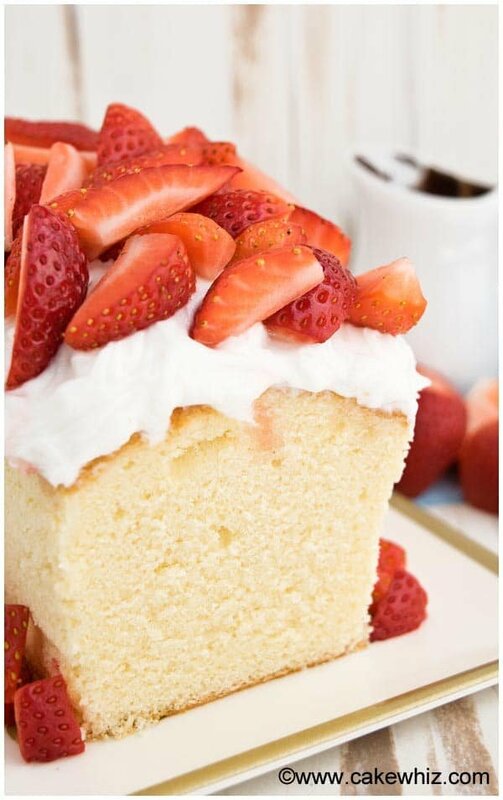 Top it off with buttercream or whipped cream, fresh strawberries and glaze. How to store sour cream pound cake? It can be stored in a sealed container in the fridge for up to 3 days. It can also be packed in freezer bags and frozen for up to 1 month. This wonderfully moist sour cream pound cake with crusty top is rich, dense, moist and has an incredible buttery vanilla flavor. What to serve with sour cream pound cake? Usually it’s served with whipped cream or glaze and fresh fruits likes strawberries, raspberries, blueberries, blackberries or peaches. Sometimes, it’s just served with a rum glaze or lemon glaze. What can I substitute for sour cream in pound cake? Greek yogurt is a good substitute but I highly recommend using sour cream since yogurt adds a subtle tangy flavor. Why did my sour cream pound cake fall? Under-baking: The cake was removed from the oven before it had fully baked, causing the top to collapse. Incorrect measurements: The ingredients may not have been measured accurately. Extra sugar and moisture can cause a cake to fall. Incorrect oven temperature: Make sure to use an oven thermometer to calibrate your oven. If the temperature is too high or too low, the cake will not rise or bake properly, resulting in a collapse. Too much leavening: Even though baking soda helps with the cake rising, too much of it can cause it to rise too quickly in the oven and then fall when it’s removed from the oven. Insufficient creaming: Butter and sugar were not creamed long enough to allow air to incorporate into the batter to allow a sufficient rise during baking. This is a simple glaze recipe that can be used for cakes, cupcakes, cookies and even muffins. In a microwave-safe bowl, add sugar, juice or milk (whichever one you like), zest or extract (whichever one you like). Mix it together. Heat in the microwave in 30 second increments, making sure to remove the bowl from the microwave and whisking everything together each time until glaze is smooth and glossy without any lumps. Pour on top of your cake, once the cake fully cools down. Follow the same recipe but add 1.5 tbsp lemon zest in the batter and top off the cake with a simple lemon glaze, once it cools down. You can use any citrus zest you like such as orange, lime, grapefruit to make other citrus pound cakes. There is no baking powder in pound cakes, only a little bit of baking soda. This classic sour cream pound cake is also perfect for carving and making those cool 3D shaped cake designs! All the ingredients MUST be at room temperature so that they blend together smoothly and it also helps create maximum volume. The key to making the best pound cake is to CREAM the heck out of your butter and sugar. That incorporates tiny air pockets into the batter, which helps it rise. You must cream the butter and sugar for 7-10 minutes or until the mixture is so pale that it’s “whitish” in color. Yes, that is the correct baking time. Pound cakes generally bake for 1 hour or a little more than that. Yes, that is the correct temperature. Pound cakes generally bake more evenly at 325 degrees than 350 degrees. 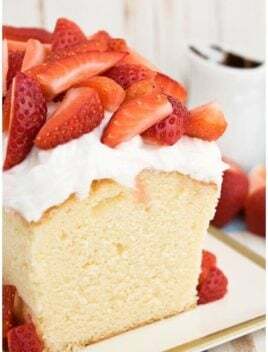 You can also use this recipe to make sour cream pound cake cupcakes but honestly, I think cupcakes should be fluffy and pound cake has a more firm texture, which is not suitable for cupcakes. You can use this recipe to make a sour cream pound cake loaf or sour cream pound cake bundt. DON’T use this recipe to make chocolate sour cream pound cake because the ratio of ingredients would need to be altered. This easy old fashioned sour cream pound cake recipe from scratch is firm and dense but still very moist. Perfect for carving/ cake decorating or just serving with whipped cream and fresh fruits like strawberries. Add butter and sugar in a mixing bowl and cream for 7-10 minutes until the mixture is so pale that it's "whitish" in color. Add eggs, one at a time, while mixing. Add sour cream and extracts and mix until just combined. Combine the flour and baking soda in a separate bowl and dump this dry mixture into the wet mixture. Mix until just combined. Don't over-mix or else you will end up with a flat and tough cake! Pour this batter in a greased/floured loaf pan (Dimensions: 10 x 5). Bake at 325 degrees for 1 hour and 25 minutes or until an inserted toothpick comes out clean. Once the cake has cooled down, frost the top with whipped cream or buttercream icing. 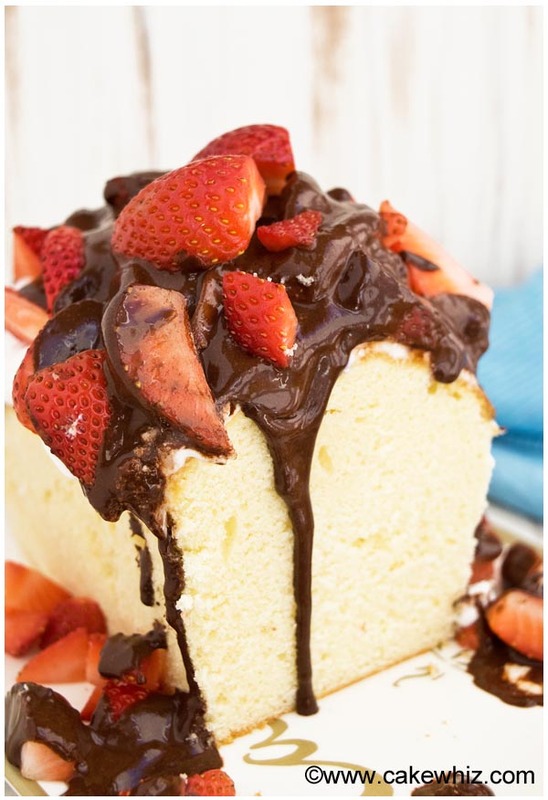 Add some fresh strawberries and drizzle Nutella syrup over the whole cake. Enjoy! This is calling my name! I want this right now! I love this! Such a classic favorite! Can you bake bgg this on a regular round CD cake pan ? I haven’t made it in a round pan. So, I am not sure how that would affect the bake time. If you try it, please let me know how it goes.